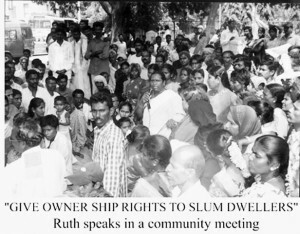 Ruth Manorama (born 1952) grew up seeing her parents engaged in active social work. She has been consistently associated with a range of issues-the rights of slum dwellers, domestic workers, unorganized labor and Dalits’, and the empowerment of marginalized women. She sees the interconnectedness between these issues, and the common cause that marginalized people share the world over. Her work crosses the borders between grassroots movements, mass mobilization, and international movements.